Best described as a ‘remote control boomerang’, the Air Hogs 360 Hoverblade is like no other outdoor toy we’ve ever seen. Made of a strong but light foam body that’s designed to withstand high impacts, all you have to do is charge up the battery and launch it either from the ground or from your hand! The special slider hand control unit can be used to make 360° Hoverblade perform amazing stunts by increasing the power as required. Recommended age for this product is 8 or over although we’re sure adults will also get as much fun from it as the youngsters! Air Hogs are world leaders in developing innovative and high performance RC planes, helicopters and vehicles for all age groups. You can check out their products online or in all good toy shops. 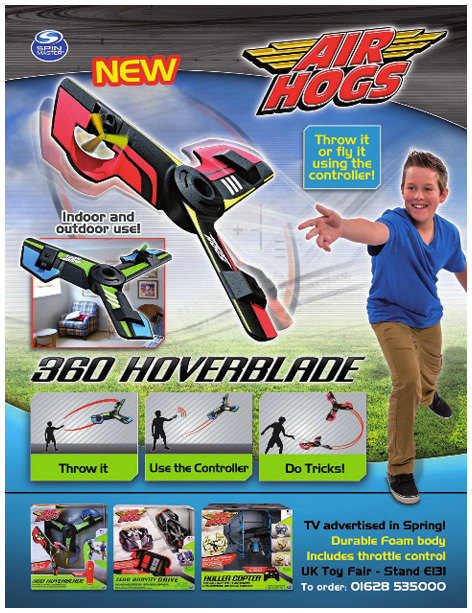 Please tell us what you think of the 360 Hoverblade by Air Hogs and Spin Master.